EMSEV 2018 will be held between September 17 and 21, 2018 in Potenza, Italy. Potenza locates about 100km east of Minlan. So Please visit EMSEV2018 website. The 2018 EMSEV workshop will focus on the observation and understanding of various kinds of electromagnetic phenomena associated with earthquakes and volcanic eruptions particularly from a multidisciplinary point of view. It would be a great opportunity for students and young researchers to present their scientific research, and achievements as well as a valuable occasion for exchanges and interdisciplinary co-operation among researchers worldwide. Abstract submission due: March 17, 2017. This session aims at different geophysical monitoring techniques which can be combined and integrated to achieve two major goals: Firstly, the imaging of volcanic source processes from the surface to the deep plumbing system, and secondly, the interpretation of geophysical signals that enable us to assess the state of volcanic activity. We aim to identify geophysical signals that are characteristic in defining background levels, detecting unrest and evaluating ongoing volcanic activity. Seismic monitoring, including infra sound, remains at the core of any monitoring program. While well-established seismic monitoring techniques are routinely applied, major advances in volcano seismology have been made in recent years allowing us to identify several categories of volcanic seismic signals, and interpret them in terms of different magmatic or tectonic processes encountered at a volcano. This session will review the wide range of seismic monitoring techniques and interpretation methods from low-cost, basic set-ups to the latest sophisticated seismological applications and modelling methods. Accordingly, we aim to cover the entire seismic frequency range from short-period to ultra-long period seismicity, tilt and other deformation signals in different volcanic settings. Volcanoes arrive at a critical state after weeks or even years of unrest before the onset of surface activity. During this period electromagnetic and geochemical methods appear to be sensitive to transient anomalous signals caused by the movement of magmatic and hydrothermal fluids. Only at a later stage seismic activity as well as ground deformation become more obvious. Therefore, we particularly welcome case studies that combine monitoring or modelling techniques of seismicity, electromagnetic signals, ground deformation, infrasound, gas monitoring, gravimetry, petrology and fluid dynamics of magmatic systems. IAG-IASPEI 2017 in Kobe will be held from July 30 to August 4. During the meetig, two EMSEV related sessons are prganized. The VAN method – named after P. Varotsos, K. Alexopoulos and K. Nomicos, authors of the 1981 papers describing it – measures low frequency electric signals, termed "seismic electric signals" (SES). SES are emitted by rocks under stresses caused by plate-tectonic forces.by which Varotsos and colleagues have successfully predicted earthquakes in Greece. The respected Professor will be awarded a prize on Saturday 17th December 2016, 12:00hrs in Athens at the TEI Athens. 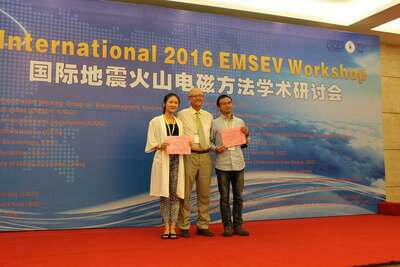 During EMSEV2016, The two best presentations done by students were awarded by Chairpersons of the sessions and by EMSEV bureau to Ms Kaiyan Hu and Mr Tao Ye. Copyright © EMSEV, All rights reserved.